Deborah is a vocal musician of Swiss descent who loves to share her heritage through music. 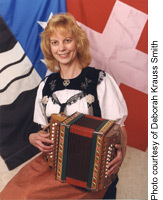 She sings Swiss folk music with yodels, plays the Swiss button accordion and is the director of the Monroe Swiss Singers and Männerchor New Glarus. Her programs include singing, yodeling, accordion playing and a slide-lecture presentation on Switzerland and its folk traditions.